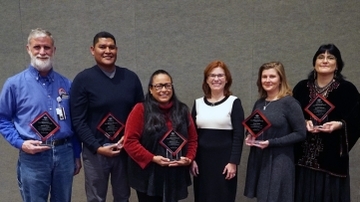 The five winners of the 2018 Gerald W. May Outstanding Staff Award were honored at a ceremony in December. Kevin Brown, John D. Couch, Glenda Johnson, Katherine Love and Tracy Wenzl were named award recipients this year and are being recognized by Staff Council for their significant contributions to the University. the awards were presented by Lawrence Roybal, interim vice president for equity and inclusion on Dec. 6. In 1990, President Gerald W. May provided funds specifically for staff recognition, and at the end of his tenure, a matching amount was made available from the Regent’s Endowment Fund. This prestigious presidential award recognizes individuals, but departments may nominate a staff member with one nomination form signed by the group. Kevin Brown | Program Specialist: College of University Libraries & Learning Sciences (second from left).